Although Bermuda is not technically in the Caribbean it has the most golf courses per square mile in the world so is a popular golfing hotspot in the region. One of the most picturesque courses is Port Royal which offers 18 championship holes over 6,842 manicured yards. Designed by Robert Trent Jones Sr. in 1970 the course has recently undergone a $14.5 million renovation and also has a 300-yard oceanfront driving range. How to visit on a superyacht: With Bermuda hosting the 2017 America’s Cup a drive is underway to encourage more superyachts to head back to Bermuda. A new marina is under construction in St George’s in honour of the America’s Cup and is aiming to attract as many as 100 superyachts during the event. Although Bermuda is not technically in the Caribbean it has the most golf courses per square mile in the world so is a popular golfing hotspot in the region. 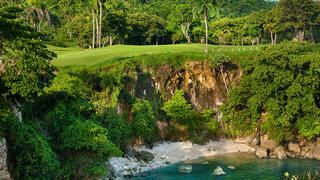 One of the most picturesque courses is Port Royal which offers 18 championship holes over 6,842 manicured yards. Designed by Robert Trent Jones Sr. in 1970 the course has recently undergone a $14.5 million renovation and also has a 300-yard oceanfront driving range. How to visit on a superyacht: With Bermuda hosting the 2017 America’s Cup a drive is underway to encourage more superyachts to head back to Bermuda. A new marina is under construction in St George’s in honour of the America’s Cup and is aiming to attract as many as 100 superyachts during the event. With dramatic views across to the neighbouring island of St Kitts, the 18-hole course at the Four Seasons in Nevis has a reputation as one of best golf courses in the Caribbean. The par 71 course was the first designed by Robert Trent Jones Jnr in the Caribbean and features dramatic changes in elevation leading to exhilarating golf with stunning views. The 15th is the standout hole at the highest point on the course while the 18th overlooks the beautiful Pinney’s Beach. How to visit on a superyacht: It is now even easier to visit Nevis as St Kitts superyacht marina Christophe Harbour officially opened earlier this year. Last Caribbean cruising season, St Kitts and Nevis enjoyed a record number of superyacht visits. With dramatic views across to the neighbouring island of St Kitts, the 18-hole course at the Four Seasons in Nevis has a reputation as one of best golf courses in the Caribbean. The par 71 course was the first designed by Robert Trent Jones Jnr in the Caribbean and features dramatic changes in elevation leading to exhilarating golf with stunning views. The 15th is the standout hole at the highest point on the course while the 18th overlooks the beautiful Pinney’s Beach. How to visit on a superyacht: It is now even easier to visit Nevis as St Kitts superyacht marina Christophe Harbour officially opened earlier this year. Last Caribbean cruising season, St Kitts and Nevis enjoyed a record number of superyacht visits. The tiny island of Canouan in the Grenadines is home to one of the best golf courses in the Caribbean. 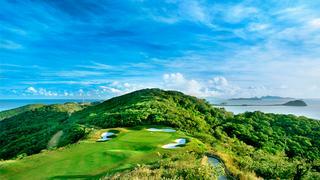 Boasting panoramic views from every hole the Grenadines Estate Golf Club has an 18-hole championship golf course. 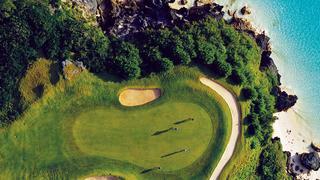 Designed by Jim Fazio, the distinctive course has incredible cliff-side views and impressive water features. How to visit on a superyacht: You can easily fit a round at the Grenadines Estate Golf Club into your itinerary if you are spending a week exploring St Vincent and the Grenadines. If there are members of your party that do not play golf then they can relax at the Canouan Resort Spa, which features glass floors so you can watch the sea life while having a massage. The tiny island of Canouan in the Grenadines is home to one of the best golf courses in the Caribbean. 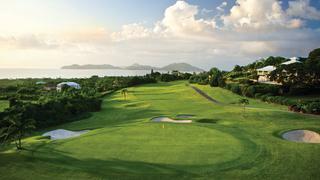 Boasting panoramic views from every hole the Grenadines Estate Golf Club has an 18-hole championship golf course. Designed by Jim Fazio, the distinctive course has incredible cliff-side views and impressive water features. How to visit on a superyacht: You can easily fit a round at the Grenadines Estate Golf Club into your itinerary if you are spending a week exploring St Vincent and the Grenadines. If there are members of your party that do not play golf then they can relax at the Canouan Resort Spa, which features glass floors so you can watch the sea life while having a massage. Having undergone a renovation the new Playa Grande Golf Course will officially open simultaneously with the new Amanera Hotel on November 23. Originally designed by the late Robert Trent Jones Sr. and now refreshed by his son Rees Jones the course spreads over 370 acres. With 10 holes played along the cliffs, the course has the most ocean-front holes in the Western Hemisphere. How to visit on superyacht: You can incorporate a visit to the new course on the “Green coast” during a private cruise or luxury yacht charter in the Dominican Republic. If you fancy having a more permanent base in the area then Amanera is currently offering a range of exclusive villas for sale, which are set within the golf course. Having undergone a renovation the new Playa Grande Golf Course will officially open simultaneously with the new Amanera Hotel on November 23. Originally designed by the late Robert Trent Jones Sr. and now refreshed by his son Rees Jones the course spreads over 370 acres. With 10 holes played along the cliffs, the course has the most ocean-front holes in the Western Hemisphere. How to visit on superyacht: You can incorporate a visit to the new course on the “Green coast” during a private cruise or luxury yacht charter in the Dominican Republic. If you fancy having a more permanent base in the area then Amanera is currently offering a range of exclusive villas for sale, which are set within the golf course. With the first nine holes played along seaside dunes, lakes and mangroves and the back nine along a rocky peninsula, the Emerald Reef Golf Club is considered to be one of the most scenic golf courses in the Caribbean. 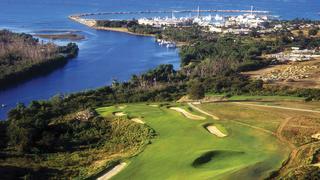 The championship 18-hole course was designed by Greg Norman and uses environmentally friendly seashore paspalum grass. 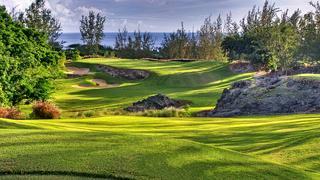 The prevailing trade winds mean that the course offers a different experience every time. How to visit on a superyacht: A round at the Emerald Reef can be fitted in at the start or end of a week discovering the South Bahamas on a luxury yacht. Nearby Georgetown has an airport, which is capable of accommodating large private jets, and you can then meet your yacht and continue your vacation. With the first nine holes played along seaside dunes, lakes and mangroves and the back nine along a rocky peninsula, the Emerald Reef Golf Club is considered to be one of the most scenic golf courses in the Caribbean. The championship 18-hole course was designed by Greg Norman and uses environmentally friendly seashore paspalum grass. The prevailing trade winds mean that the course offers a different experience every time. How to visit on a superyacht: A round at the Emerald Reef can be fitted in at the start or end of a week discovering the South Bahamas on a luxury yacht. Nearby Georgetown has an airport, which is capable of accommodating large private jets, and you can then meet your yacht and continue your vacation. World renowned Casa de Campo in the Dominican Republic is home to three of the best golf courses in the Caribbean — Teeth of the Dog, The Links and Dye Fore. Pete Dye and his wife Alice designed all three courses, with the most famous being the Teeth of the Dog. Dye claims that “God made seven holes”, which are along the side of the ocean, and that he only had to create the other 11. The course first opened in 1971 and was renovated in 2005. How to visit on a superyacht: The marina at Casa de Campo can accommodate yachts up to 76 metres. The resort is a perfect stop off if you are looking for some action packed fun during a private cruise or luxury yacht charter in the Caribbean. As well as golf, the resort also has extensive equestrian facilities, including three polo pitches, a 245 acre Shooting Center, 13 tennis courts and extensive water sports. World renowned Casa de Campo in the Dominican Republic is home to three of the best golf courses in the Caribbean — Teeth of the Dog, The Links and Dye Fore. Pete Dye and his wife Alice designed all three courses, with the most famous being the Teeth of the Dog. Dye claims that “God made seven holes”, which are along the side of the ocean, and that he only had to create the other 11. The course first opened in 1971 and was renovated in 2005. How to visit on a superyacht: The marina at Casa de Campo can accommodate yachts up to 76 metres. The resort is a perfect stop off if you are looking for some action packed fun during a private cruise or luxury yacht charter in the Caribbean. As well as golf, the resort also has extensive equestrian facilities, including three polo pitches, a 245 acre Shooting Center, 13 tennis courts and extensive water sports. Another Caribbean golf course designed by Robert Trent Jones Jnr, every hole of the par 72 course at Royal Westmoreland offers views of the Caribbean Sea. Considered to be one of the best par 3 courses in the world, the Royal Westmoreland course is set within an exclusive gated community. How to visit on a superyacht: You can visit Royal Westmoreland during a luxury yacht vacation in Barbados. Make sure you also visit Diamonds International boutique which is located in the Royal Westmoreland Clubhouse and offers elegant jewellery and luxury timepieces. Another Caribbean golf course designed by Robert Trent Jones Jnr, every hole of the par 72 course at Royal Westmoreland offers views of the Caribbean Sea. Considered to be one of the best par 3 courses in the world, the Royal Westmoreland course is set within an exclusive gated community. How to visit on a superyacht: You can visit Royal Westmoreland during a luxury yacht vacation in Barbados. Make sure you also visit Diamonds International boutique which is located in the Royal Westmoreland Clubhouse and offers elegant jewellery and luxury timepieces. 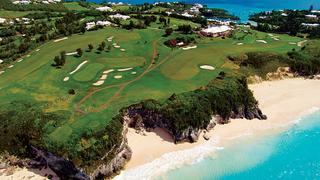 Another Bermudan establishment to make it onto our list of the best golf courses with ocean views is the Mid Ocean Club. First designed by Charles Blair Macdonald in 1921 the course is set across undulating ground with the Atlantic providing a dramatic backdrop. The challenges start from the first hole, which features no-fewer than 22-bunkers. It is a private member’s club but visitors are allowed to play on certain days as long as they adhere to specific conditions. How to visit on a superyacht: With Bermuda hosting the America’s Cup in 2017 you could fit in a round while also taking in all the sailing action. 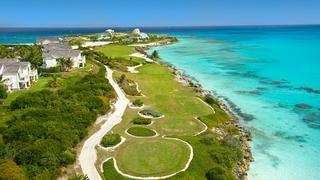 Another Bermudan establishment to make it onto our list of the best golf courses with ocean views is the Mid Ocean Club. First designed by Charles Blair Macdonald in 1921 the course is set across undulating ground with the Atlantic providing a dramatic backdrop. The challenges start from the first hole, which features no-fewer than 22-bunkers. It is a private member’s club but visitors are allowed to play on certain days as long as they adhere to specific conditions. How to visit on a superyacht: With Bermuda hosting the America’s Cup in 2017 you could fit in a round while also taking in all the sailing action.